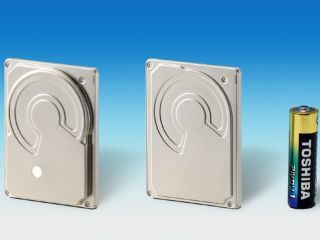 Toshiba today introduced new 80GB and 160GB 1.8-inch hard disk drives, the same size drives as those in the new Apple iPod Classic, announced yesterday. The new Toshiba MK1626GCB 160GB model is the highest-capacity 1.8-inch drive on the market with a CE-ATA interface, Toshiba claims. Such drives are suitable for portable media players such as the new Apple iPod Classic, and the near identical launch date for the two products is unlikely to be just a coincidence. The drives are expected to be used in digital audio players, digital video recorders, PDAs, computer notebooks and other portable devices. The 160GB Toshiba MK1626GCB disk drive uses a dual-platter design and measures 8mm high, while the 80GB Toshiba MK8022GAA model features a single-platter design and is 5mm high. Both units spin at 3600rpm and have 15 millisecond seek times. The drives can transfer data at up to 52Mbps (160GB) and 66Mbps (80GB) respectively. No prices or availability dates were mentioned at this stage but the drives are likely to surface this side of Christmas.